There isn’t quite anything like sipping on ice cold limoncello after dinner with good friends on a hot summer night. It does take time to make so you’ll need to start now to have a good batch of it ready to go for those summer nights. Limoncello used to be hard to find but is gaining in popularity, however the good stuff is never cheap. You can easily make it at home and it tastes so much better. It’s great to start now when you are probably drowning in extra lemons that you don’t know what to do with. I prefer to use Lisbon or Eureka lemons over Meyer lemons. The Meyer’s just don’t offer the real lemony taste that I feel this drink calls for. Plus you would need about double the amount of Meyer’s as they tend to be much smaller. The longer you let the mixture sit, the flavor will intensify but the alcoholic “zing” will mellow. I like to go about 20 days on each rest period to allow it to mellow while also having some intensity. 1. 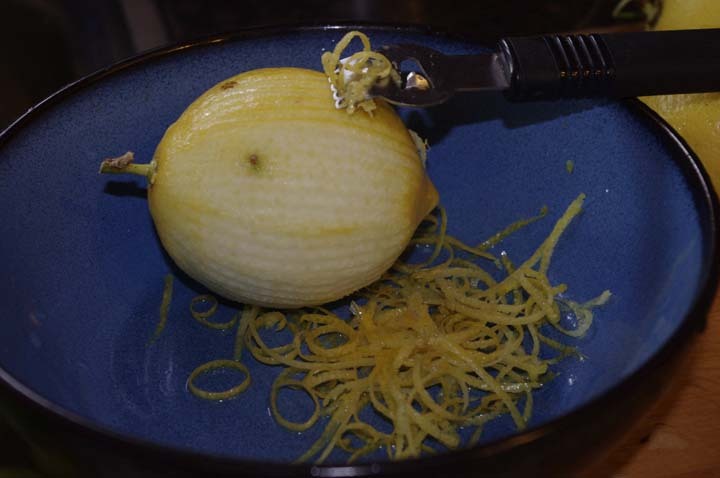 Avoiding the pith (white part of the peel) remove the lemon zest with a sharp knife or zester into a large glass or ceramic pitcher. 2. Pour one 750mL bottle of vodka over the zest, cover tightly and store in a cool dark place for 15-30 days. 3. In a saucepan combine water and sugar and heat until sugar is completely dissolved. Allow to cool. 4. Add syrup and remaining vodka to the lemon zest and vodka mixture. Cover and let sit again in a cool dark place for 14-30 days. 5. Strain mixture into glass bottles and store in a cool dark place or give away as gifts. 6. Refrigerate before serving or pour over ice. A little goes a long way so I recommend serving it in cordial glasses. Do you wait for the first 30 days to be up before adding the syrup to it, then finish with the additional 30 days?